Solomon said she hopes to work in academia. Emily Solomon accidentally became executive president of the Student Government Association. The two top vote-getters for the position turned it down, and then-freshman Solomon’s name was the next highest on the list with 12 votes—though she had not been running. Solomon accepted the role in spring 2014, and has since been re-elected twice since then. In her three years as executive president, Solomon has worked to improve communication between SGA and faculty, college administrators, and the board of trustees. Next month, she will walk at graduation and be handed a Bachelor of Arts degree in visual and media arts. Solomon, 21, grew up in Merritt Island, Florida, a beach town on the Atlantic Ocean. She was shy and introverted for the majority of her childhood, she said. When she wasn’t focused on her academics, Solomon was reading or watching action-adventure shows and books—her lasting favorites include Teen Titans and Eragon. She began her student government career in middle school, and eventually served as executive president her senior year of high school. But she says many of the leadership skills she uses today actually came from her time as a stage manager in her high school’s theater department. Solomon’s theater experience and affinity for behind-the-scenes film features brought her to study visual and media arts at Emerson. She wanted to become a director. 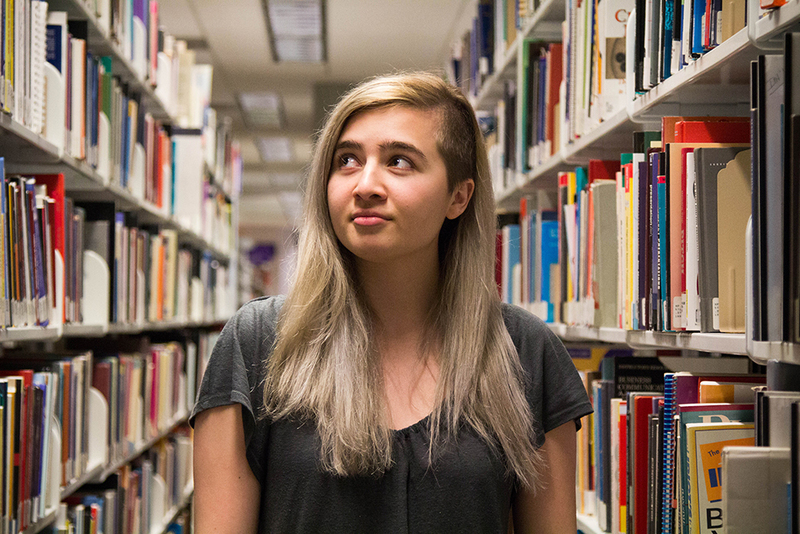 Solomon says she wants a career in academia—particularly, in discussing how the media we consume affects how we think. Eventually, she’d like to get a graduate degree in media studies and teach on the college level. It’s her goal to write off her Netflix subscription on her taxes as a professional expense. For now, though, she’s considering a temporary job on Emerson staff. Solomon hadn’t planned to continue student government in college, but she went to an information session for freshman class council anyway. There, the executive presidentadvertised the executive assistant position as a role to learn the workings of the executive board and of the college. She said she couldn’t resist joining. Come election season the spring of her freshman year, Solomon actively encouraged her peers to vote. She thinks this is why she got 12 votes for executive president that year—putting her third in line to accept the position. Sharon Duffy, assistant vice president for student affairs and SGA advisor, and the outgoing president called Solomon into Duffy’s office after the election. Though Solomon had doubts about accepting the position, they convinced her she was ready. Duffy said she was impressed by Solomon throughout her freshman year, and knew Solomon had thought about running for SGA president someday. When Solomon first came into the position, she wanted to raise awareness about SGA’s existence among students, administration, and faculty. “I wanted to get rid of this weird atmosphere that seemed to exist where administration and staff didn’t know how to reach out to students,” Solomon said. She said her strength in this position has been putting the student experience in terms administrators can understand. She’s proud of the increased communication between SGA and college staff and faculty. Student representatives now serve on many administrative committees, and college officials are often invited to SGA joint session meetings. Solomon said the position of executive president overwhelmed her at first, and though she has learned to cope with responsibility, it’s taken a toll on her mental health. She said her attention has often been swept up in SGA, and in her role as SGA president, rather than in her academics or social life. Solomon is close with her father, Michael, and said he prompts her to think her decisions through. At one point, they discussed whether or not being on SGA was best for her. Her father said that she argued that SGA was giving her experiences she couldn’t get inside the classroom. He’s always known her to be smart, but SGA brought another side out of her. “In the last four years, I've watched her develop into someone very socially savvy, and focused on what’s right in the world,” he said. Duffy said she has watched SGA become an open and accepting place under Solomon’s leadership. But the disconnect still exists with the student body. Only 139 of students voted in this year’s SGA elections—about 3 percent of the undergraduate population. Many students only know her from Orientation Week. “I remember her from Orientation, and I was really impressed with her speech and what she said,” said Jacquelyn Bogaczyk, freshman writing, literature, and publishing major. Solomon said she would also like to see future generations of SGA working with Faculty Assembly to update curricula. She said this includes ensuring that professors aren’t teaching practices no longer used in the industry, and also helping to structure cultural competency and sensitivity training. Solomon will deliver her final remarks as a student representative for the Board of Trustees this month. She wants to encourage the college to make decisions that are more deliberate and intentional. She said this is something SGA could improve as well, especially in including more students’ voices in SGA decisions. She said their input is essential to helping craft a college experience. Correction, April 20: A previous version of this article stated Solomon was 22 years old.